A key security feature for application developers and administrators is to be able to allow or deny incoming requests based on source IP addresses. This capability can help you do production testing without exposing your app to the world, block access to your app from specific geographies or block requests from a malicious user. Today, we’re thrilled to announce the beta release of Google App Engine firewall. With App Engine firewall, you simply provide a set of rules, order them by priority and specify an IP address, or a set of IP addresses, to block or allow, and we’ll take care of the rest. When App Engine firewall receives a request that you’ve configured to be denied, it returns an HTTP 403 Forbidden response without ever hitting your app. If your app is idle, this prevents new instances from spinning up, and if you’re getting heavy traffic, the denied request won’t add to your load — or cost you money. App Engine firewall replaces the need for a code-based solution within your app that still allows requests in, but which can cost you resources and still expose your app. You can setup App Engine firewall rules in the Google Cloud Console as well as with the App Engine Admin API or gcloud command-line tool. Let’s say you’d like to test your application and give access only to browsers from your company’s private network. Open your firewall rules in the Cloud Console and you’ll see a default rule that allows all traffic to your app. First, add a new rule allowing traffic only from the range of IP addresses coming from your private network. Then, update the default rule to deny all traffic. As with typical firewall semantics, App Engine firewall evaluates rules with a lower priority value first, followed by rules with a higher value. In the example above, the Allow rule with a priority of 100 is evaluated first, followed by the default rule. To make sure that your set of firewall rules is working as intended, you can test an IP address to see if a request coming from this address would be allowed or denied. 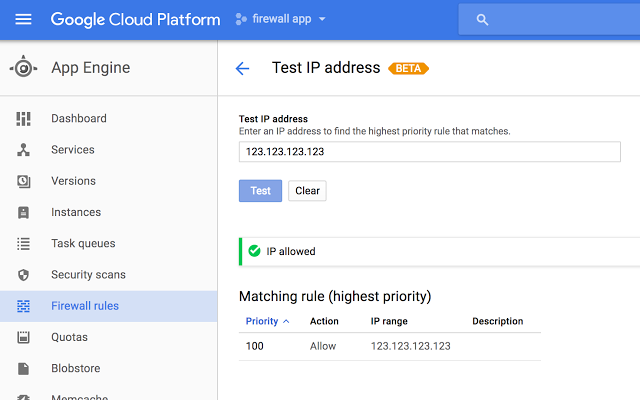 From the Cloud Console, click the Test IP tab in the Firewall Rules section. The response indicates if the request can proceed and indicates the specific firewall rule that matched the provided IP address. With App Engine firewall, it’s easy to set up network access to your app and focus on what matters most: your app, without worrying about access control within your code. Check out the full documentation here. App Engine firewall is in beta, so avoid using this functionality in production environments. If you have any questions, concerns or if something is not working as you’d expect, you can post in the Google App Engine forum, log a public issue or get in touch on the App Engine slack channel (#app-engine). Share the post "Introducing App Engine firewall, an easy way to control access to your app"